The jamón ibérico is made with one of the most remarkable products of Spanish gastronomy: the Iberian pig, a breed found only in the peninsula of the same name. At Enrique Tomás we want to exalt this delight to the maximum, which is why we offer a product of the highest quality, made from the hind leg of Iberian pigs fed with food, cereals and grass and dry cured during 24 months. Our Jamón Iberico de cebo has four varieties: Selection, an exquisite alternative, the one from Salamanca (Guijuelo), with a sweet and friendly taste, the one from Huelva (Jabugo), with strong tones, and finally the one from Cáceres-Badajoz (Extremadura), with aromatic and explosive touches. No matter what you choose, whole, sliced, boned or wrapped, one thing is certain: you'll get the most out of it! The Iberian pig is a breed unique within its species and occurs only in Spain and Portugal. Its genetics allows it to infiltrate fat into the muscle, which gives its flesh white veins and a unique taste and flavour. At Enrique Tomás we want to exalt this product to the maximum, that's why we offer a high quality jamón ibérico de cebo, elaborated after an exhaustive selection of the best specimens, with a rigorous “cooking” and a strict curing process in which all the conditions are guaranteed to obtain, finally, a perfect and delicious jamón on the palate. For us, the most important thing is the satisfaction of our customers, that's why we take care of the selection process and the elaboration of our Iberian products to guarantee a delicious experience. Our jamón ibérico is made with pigs of this breed that have been fed with cereals and enriched with vitamins, as well as grass. With a perfect maturing period of 24 months, we are able to bring to your table a product with three origins: Salamanca (Guijuelo), Huelva (Jabugo) and Cáceres - Badajoz (Extremadura), offering different nuances for the different palates, but with a common element: the quality of its raw material. Once you have chosen the origin you want to enjoy, you can buy jamón online in the format that best suits your needs. 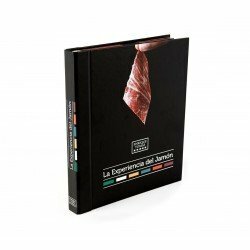 We have whole pieces of Selection and our three origins, in addition to our product in boneless format, sliced with a knife or slicer and vacuum-packed to enjoy at home with total comfort or in spectacular packages (packs) of 3 kilos of jamón, ideal for travelling and to surprise friends and family when tasting this delicacy. 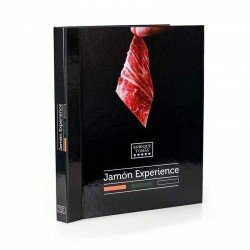 Don't think about it any longer, enjoy a unique jamón ibérico de cebo.